11 Nights/12 Days – Alternate 7-Day Itinerary also shown below. Did you know that Brokeback Mountain doesn’t actually exist? But the locations where it was filmed sure do! And, did you know that Brokeback Mountain was filmed in Alberta not Wyoming? Why Alberta? Because of the spectacular scenery and accessible wilderness found in abundance in Alberta. So come follow the Brokeback Mountain trail and have the vacation of a lifetime in the uncrowded surroundings of Southern Alberta – including an overnight Horseback Pack Trip and Tipi Camping. Here you’ll experience firsthand the stunning visuals of the movie, while relaxing in Alberta’s wide open spaces. Pick up your rental vehicle and spend the day exploring Calgary. Established by the North West Mounted Police in 1875, the city's population now numbers just over one million. Don't miss Heritage Park Historical Village, a "living museum” with costumed interpreters, a steam train, a scale-model sternwheeler, an old-fashioned candy store and much more. And, after checking out restaurants and shopping locations frequented by the Brokeback Mountain cast, settle into one of their favorite hotels for the night, the Fairmont Palliser. Today you can take time to visit the Northern Wilds Exhibit at the Calgary Zoo, stroll the riverside pathways, dine on the world's finest beef, go up the Calgary Tower and shop along Stephen Avenue Mall. This evening you can ample on over to Ranchman’s Restaurant. Ranchman’s is featured as Jack & Lureen’s bar in Brokeback Mountain and it is as authentic a cowboy bar as you’ll ever mosey across. And then its back home to the Fairmont Palliser for another restful night. Saddle up and head down The Cowboy Trail. Nestled along the foothills of Alberta’s Rocky Mountains, the Old West is still evident in the art, history, food, hospitality and culture of the residents who live and work along this famous route. As you near Waterton, you can stop briefly to visit the quaint little town of Cowley. Brokeback Mountain opens with a haunting scene of big sky country. This is Cowley, the town where Heath Ledger (Ennis del Mar) and Jake Gyllenhaal (Jack Twist) meet. Follow the highway south to Waterton Lakes National Park where you’ll spend a very pleasant evening at the Waterton Lakes Lodge. After a short 20 minute drive in the foothills, you arrive at a historic working cattle and horse ranch to begin preparations for your pack trip. Mount up and head for the high country, where you’ll ride across open meadows filled with a dazzling array of wildflowers and meander through silent shady pine forests. Stay overnight at a remote private wilderness base camp with cabins, cedar hot tub and outdoor showers. After a hearty western breakfast, you’ll saddle up and set off from your base camp to savour more magnificent scenery. Your guide is always there to help with riding instructions, and you can be sure that there will be no shortage of western stories about the area, past and present. After a western style lunch you will head back across the countryside, through the open meadows and shady pine forests, to the ranch house. 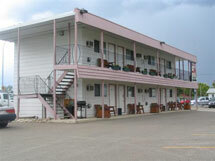 A brief drive then takes you to Fort MacLeod where you will spend the night at another Brokeback Mountain cast favourite, the Red Coat Inn Motel. Rise and shine in the heart of the location for the making of Brokeback Mountain. Stop in at The Java Shop for a wholesome breakfast, and possibly sit in one of the same seats as the cast and crew. The Java Shop is where Ennis del Mar was filmed eating a slab of apple pie. Fort Macleod is also Ennis and his family live above a Laundromat. Spend the rest of your day exploring various film locations and a few local attractions. Finish your day with a refreshment at the Queen’s Hotel (Cassie’s Bar in the movie), and return to your Brokeback Mountain retreat at the Red Coat Inn Motel. Until Brokeback Mountain, the southern Alberta town of Fort MacLeod was been know for its Empress Theatre and proximity to Head-Smashed-In Buffalo Jump. Located 18 km north & west of Fort Macleod, at a place where the foothills of the Rocky Mountains meet the great plains, this is one of the world's oldest, largest and best preserved buffalo jumps. Designated as a UNESCO World Heritage Site in 1981, Head-Smashed-In has been used continuously by aboriginal peoples of the plains for more than 5,500 years. Complete your journey along Highway 2 to Calgary and your return home. For dinner, savour a unique taste sensation, buffalo stew or perhaps buffalo burgers. This will fuel your body for a night of breathing in the fresh prairie air and sleeping under the stars in your Tipi Camp. Separate prices are available for this 7-Day component of the Brokeback Mountain itinerary. Enjoy a truly Albertan breakfast after you awake from your Tipi Camping and before you set out on today’s adventure. Today you’ll travel through Kananaskis Country, an unspoiled paradise of towering mountains, pristine lakes, evergreen valleys and glacial streams. Brokeback Mountain is actually a composite of angles, from the peaks of Three Sisters flanking the town of Canmore, to Fortress and Moose Mountain – all in Kananaskis Country. Some of the key scenes from the movie, featuring a collection of Alberta’s finest campgrounds, are shot at Upper Kananaskis Lake which is easily accessible. Overnight at the Executive Resort at Kananaskis. Take a full day to explore Banff and area. In the town site you'll find lots of excitement - shopping, cafes, nightlife, and museums. Check out the Cave and Basin National Historic Site, birthplace of Banff National Park.. Take the eight minute ride up the Banff Gondola and savour the incredible panoramic view, and then take a dip in the hot mineral pools at the newly-renovated Upper Hot Springs. Overnight at Brewster’s Mountain Lodge. There is nowhere quite like the Drumheller Valley; Dinosaur Capital of Canada! You will pass several Brokeback Mountain film locations as you travel in the Drumheller area. These include the Texas Highway, the Post Office, the Clown Rodeo, Signal Bar & Trailer, the Highway to Signal, the church where Ennis and Alma’s wedding was held and the A&P Grocery store. And you won’t want to miss the Royal Tyrell Museum - Canada’s largest dinosaur museum. Overnight at the Best Western Jurassic Inn. Follow the Dinosaur Trail, and experience the world of hoodoos, as you journey to Dinosaur Provincial Park. Then travel the highway through Brooks and make your way to Calgary for the final night of your Brokeback Mountain adventure tour! Overnight at the Sandman Hotel, Spa & Suites, Calgary Airport. One or more activities in each location: Heritage Park Historical Village, Northern Wilds Exhibit – Calgary Zoo, Banff Gondola, Royal Tyrrell Museum of Paleontology. Just tell your personal planning adviser if you would like to stay longer or do more. Your vacation can be tailored to your schedule and interests with additional days and/or activities. More great ideas to include when designing your Tailor Made Western Experience tour can be found on our Custom Adventures page. Separate prices are available for the total 12-Day Brokeback Mountain itinerary.